I ran across this blog post today, and it made me think about the fight scenes in my own book. 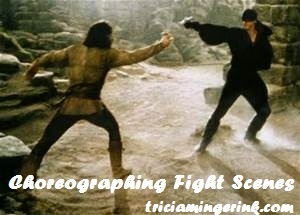 In the post, Lisa Voisin addresses 8 things that writers forget about when writing fight scenes. 1. Think about your POV character. Someone who knows nothing about fighting will describe the fight with vague details. This can be a good thing for you as the writer. I had a fight scene in a book that I was worried about. It involved several characters in different places in a room all fighting different people. It seemed like a lot to fit into a small space on the page, until I realized that my POV character was watching the fight and would only focus on the parts of it at a time. If your POV character is knowledgeable about fighting, lack of details or technical fight language isn’t a bad thing either. You are in the character’s head. They’re too busy fighting to be worried about what type of punch was thrown or the fancy name for that maneuver. 2. It is a good idea to get some knowledge about bodily injuries. In a fight, the odds are high that one of your characters is going to get injured in some way. I have the advantage of having a mom with a medical degree. It saves a lot of awkward Google searches when I can ask her, “Where can I stab someone here without killing them?” or “What happens if you grab a sword and it slices your hand to the bone?” If you don’t have someone you can ask in person, Google with caution. The pictures you’ll pull up can be a little graphic (talking from experience here). 3. Show some detail, but not too much. I’m not a guts spilling on the ground type of person. I’m okay with blood gushing in a few places, but I’ve put books down before when they start describing entrails flopping around. I don’t like gore for the purpose of gore, and I usually hold back on making my fight and battle scenes as gory as they’d be in real life. In this case, I think a little can go a long way. I usually show some blood, a touch of gruesomeness, then pull back into how the character feels about seeing it. Trust your readers’ imaginations with this one. Give them a small glimpse and their imaginations will fill in the rest of the description without you needing to go into detail. 4. Don’t chatter in battle. Let’s try an experiment here. Go outside and grab stick. Start swinging it around for several minutes. Pretend you’re sword fighting. Now try to talk. Notice how it is suddenly a lot harder to breathe? And your movements become jerkier because you are trying to focus on swinging your stick AND talking? That’s why your characters shouldn’t talk and fight at the same time either. If you have some witty banter to be exchanged, have them do it before. Get the talking out of the way, then fight. 5. Keep skill levels realistic. It’s hard to pick up a sword and even swing it right, much less fight with it. Give your characters time to train before you ask them to save the world. 6. Battles are ugly affairs. Remember that your characters will have to react to the things they are seeing. Maybe not in the moment, but it will have an effect. If this is your character’s first fight, it will hit them differently than if it is their seventh or eighth. Show your character dealing with it. 7. Keep it short. Most battles don’t last long. A minute is a long time for a one on one battle. It should last only seconds. So how do you balance a short battle with the need to make it tense and climatic? Too short and it will feel anticlimactic. I usually err on the side of short sentences and short words to create quick actions. To make a longer scene, break up the fighting with something else, like one character trying to get away or some other kind of interruption. 8. Train yourself. While I have never taken a martial arts class, I have researched sword-fighting. There are a lot of sword fighting manuals out there. Look for one written by a medieval martial arts teacher. Same thing if you need to know about archery or fist fighting. You should know more about your type of fighting than ever makes it into your book. So how do you make your fight scenes realistic? 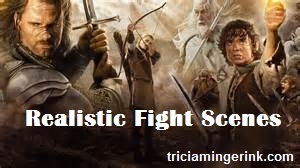 What bothers you when you read fight scenes in books?